Are you raising rabbits as part of a homesteading enterprise? If so, this means that for you, spring is in full swing. Your does have been kindling, and your kits have been growing. The chances are good that you will have quite a few more litters as spring and summer progress. Your rabbitry will be producing rabbit meat (lapin) abundantly to feed your family and your pets. Why Raise Rabbits for Meat? Humans are obligate omnivores, meaning we require both plant- and animal-based nutrition for optimal health. For example, there are no plant sources of Vitamin B-12. None. Any humans who eliminate animals and animal products such as cheese from their diet must eat vitamin supplements to stay healthy. Our dogs and cats are another reason to raise rabbits. Cats are obligate carnivores, but both dogs and cats are likely to experience a bloom of health when switched to a raw, species-appropriate diet. "I have recently changed the way I feed my cats onto a raw meat diet, after a long time of dealing with upset stomachs and the vet costing a fortune on tests only to be told it is down to diet. Having tried every commercial diet with no change, decided to change to raw as last resort. Why did I not do this before, the cats have recovered and are looking better than they have in a long time. Will feed raw meat from now on." Here are some guidelines for marketing your rabbit fryers or for utilizing them for your own family's needs. Market age is ideally 8 weeks of age. New Zealand Whites and Californian rabbits which have been selectively bred for rapid weight gain on excellent feed are the breeds most likely to reach market weight by 8 weeks old. 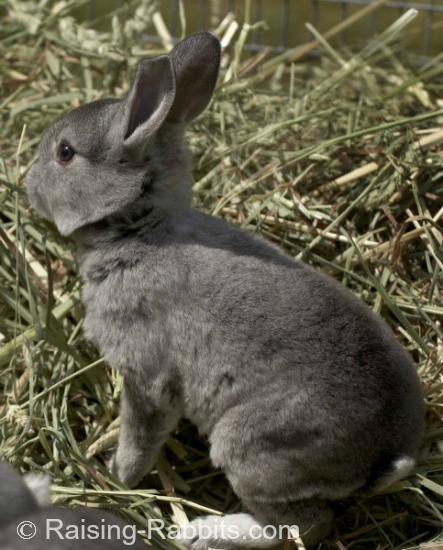 But certain strains of the heritage breeds such as Americans and Silver Fox Rabbits also reach market age as early as 8 weeks. A rabbit processor will purchase your fryers by the live pound. Market weight varies slightly by the processor, however they’re all in the following ballpark: Fryer rabbits must weigh a minimum of 4.5 - 5 pounds (depending on the processor), and a maximum of 5.5 - 6.5 pounds. Over 6 pounds, the rabbits are usually considered "broilers" or "stewers," and the price per live pound takes a major hit. Broilers are "athletic," meaning tough and difficult to chew, unless they are stewed or crock-potted. If yours are "meat mutts," they may take a few more weeks to reach 5 pounds. We recommend not waiting longer than 12 weeks of age to butcher your meat rabbits if you wish to use them in a fried rabbit recipe. No matter what they weigh, they may begin getting tough beyond 12 weeks of age, even if they have not reached an ideal market weight. Whatever breed you raise, butcher any rabbits destined for fryer-hood by 12 weeks at the latest. If you follow this rule of thumb, your fryers will be fryers, not fryer-sized athletic stewing rabbits. If yours is a smaller breed, it will be lighter in bone as well, maintaining a decent meat to bone ratio. This could be why the Florida White rabbit (adult weight is 6 pounds) has an excellent reputation as an alternative, smaller, meat rabbit. What you cannot use immediately can go into the freezer, either whole or cut up into pieces, for use during the fall and winter when rabbits tend to produce fewer litters. 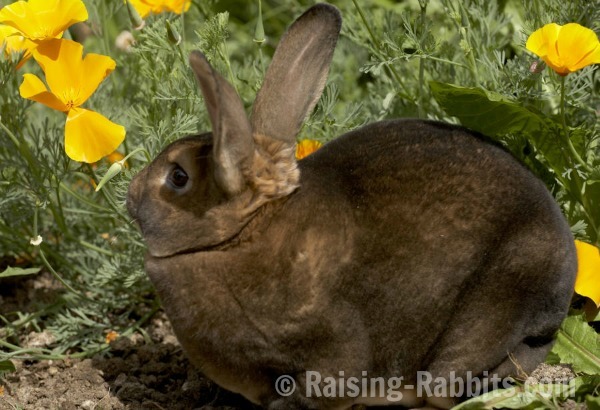 See Rabbit Farming for more tips on rabbit husbandry and additional ideas for utilizing both meat and pelts. Understanding the realities of life for rabbits in the wild will definitely help you better take care of your own domestic rabbits. The rabbit’s greatest fear is not pain, it is anxiety and stress. Rabbits not only have smaller pain centers in the brain, but they also may experience some sort of a short circuit in the brain while being preyed upon that eliminates most or all of the pain. On the other hand, the sight or sounds of a nearby predator sends a rabbit’s anxiety levels through the roof. In order to protect themselves from anxiety, they are timid and cautious by nature. Move slowly around your rabbits until they are all fully aware of your presence. It also helps to speak calmly as you enter the barn. Develop a routine of care that the rabbits can rely on - the same feeding schedule every day, etc. Know that any sudden changes in a rabbit’s life is likely to raise the animal’s stress levels. If severe enough, elevated stress has the potential to disrupt the rabbit’s intestinal function through an imbalance in bacterial flora, and a potentially life-threatening diarrhea can ensue. The movie "Rabbit Fever" is now available on Amazon.com. "5 teenagers. 25,000 rabbits. One extraordinary competition. Who will win the national title of Rabbit King & Queen?" Rabbit Fever - Check it out! Your friends at Raising-Rabbits.com wish you a wonderful April 2013.